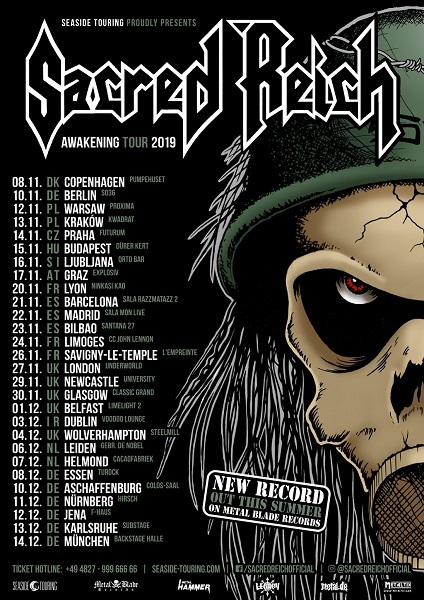 US thrash metal legends, SACRED REICH are currently in the studio recording their first studio album in 23 years, titled ‘Awakening’, which is anticipated for release later this Summer. To follow the release, the band have announced a full European tour, kicking off in November and including 6 UK & Irish shows. SACRED REICH recently welcomed the return of their former drummer, Dave McClain, following his departure from Machine Head after 23 years with the Bay Area metal outfit. DEW-SCENTED start working on new album + Japan tour and Euro dates with Sacred Reich announced!